A clear glass storefront surrounded by a paneled façade. Rectangular recessed lighting units. Cantilevered shelves. 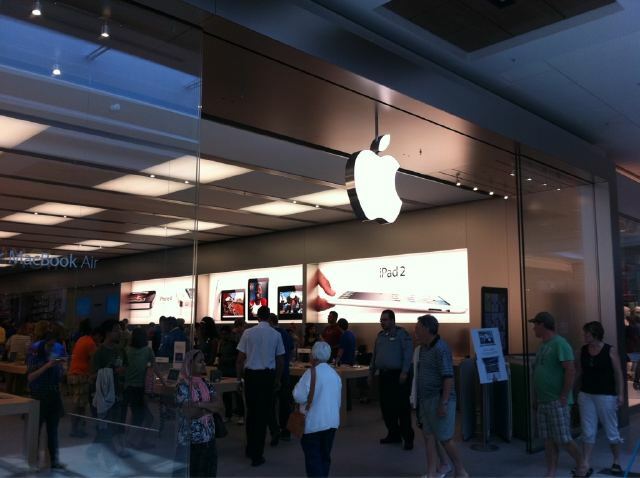 Rectangular tables arranged in a line in the middle of the store parallel to the walls and extending from the storefront to the back of the store. Yep, that's an Apple Store alright. And that's the wording that Apple included in their trademark application for the Apple Store design, inarguably as much of an icon for Apple as the patented designs of their products. The trademark was granted last week by the United States Patent and Trademark Office. Apple filed the application back in 2010, but was twice rejected. In response, Apple filed a 122-page brief on how their design could be considered "inherently distinctive". This brief included customer surveys and photos of various Apple Stores, and apparently was enough to persuade the USPTO that the trademark application should be approved and appropriately registered. We doubt Apple's going to be putting a little ™ in the corner of each Apple Store, but this does give Apple some leeway to pursue a legal offense against retailers they consider to be infringing on their trademarked design. It's worth nothing that this isn't a design patent, for Apple to pursue claims against another retailer they'd have to prove that customers are likely to be confused by the other company's allegedly similar design. If you're thinking that Microsoft's retail stores might be the target of Apple's pursuit of a trademark on their own, that very well might be. Microsoft's first retail store opened in October 2009 in Scottsdale, Arizona, followed a week later by another store in Mission Viejo, California. Apple's trademark application was submitted seven months later. To date, Microsoft has opened thirty retail stores in the United States and Canada. The appearance of Microsoft Stores really is quite similar to that of Apple's, with a clear glass storefront surrounded by a paneled façade, recessed rectangular lighting units, and rectangular tables - though Microsoft's tables are arranged in lines the middle of the store parallel the the storefront and extending between the walls. Numerous fake Apple Stores have been found in China (where Apple does have an official retail presence that draws massive foot traffic), though Apple's trademark from the USPTO is only valid within the borders of the United States.